After the family, the basic unit of ancient Aztec government was the calpulli. Families didn't individually own land, the land was owned by a group of families, the calpulli. This structure of local government existed long before the Aztec empire. The leadership in the calpulli would be responsible for the basic needs of the group. They would set up the telpochalli, a school for common citizens (read more about the telpochcalli and other aspects of Aztec culture). They were also responsible to make sure taxes were collected from the group. In the cities, calpullis became less family-related and more regional. As is the case today, city life brought many different individuals of different race and culture together. Read more about the structure of the ancient Aztec government here. The nobility and priesthood had a lot of power in Aztec society. But although the nobility provided leadership, they weren't automatically put in government positions. In the cities, each calpulli would have a leader, and those leaders would form another council. It was the city councils that held a lot of power in the ancient Aztec government. By the early-mid 1400s, three powerful city-states had formed the famous Triple Alliance in central Mexico. These cities were Tenochtitlán, Texcoco, and Tlacopan. These cities dominated central Mexico, and it was Tenochtitlán that came to dominate the empire. Each council would have a kind of "executive council" within it. 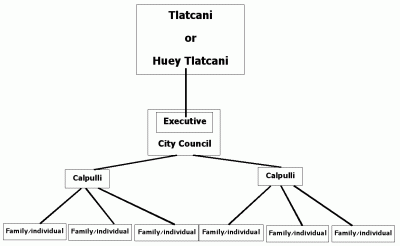 4 members would be chosen who would lead, and out of those there would be one tlatcani - the leader of the city. These leaders would not only control the city proper but the surrounding area. In the leading city of Tenochtitlán, the city leaders led the empire. The city council has been compared to the Roman senate. The leader was known as the Huey Tlatcani, or Great Speaker. This was the emperor, who was worshipped as a god. His rule was supported not only by the city council, but also the priests, judges, governors, and a host of other officials. Moctezuma II is the famous Huey Tlatcani who ruled when Hernan Cortes arrived in the New World. The Huey Tlatcani did have absolute power in a sense. However, he did come to power by a semi-democratic system, and he could be removed from power. How this position was decided upon is not fully understood - it doesn't seem to have been hereditary, but family lines did play some part. The ancient Aztec government did not rule an empire in the way we often think of the word. The control didn't stretch into every corner of life - rather, conquered lands were forced to pay tribute, but left a certain amount of freedom. Warriors made small attacks on surrounding peoples and took prisoners which would be sacrificed. Read more about the concept of the Aztec empire here. Although the expansion of the empire was often good for the conquered people - better trade and infrastructure, for example, the conquered people still obeyed in fear. Their hatred would cause many of them to turn on the empire when the Spanish gave them the chance. For more on the area of Aztec influence, see this Aztec map.